Arrested Motion (AM): Can you tell us a little about your show at Space Yui? Have you named the show yet?Â You mentioned in your blog that you were struggling a bit with this body of work. 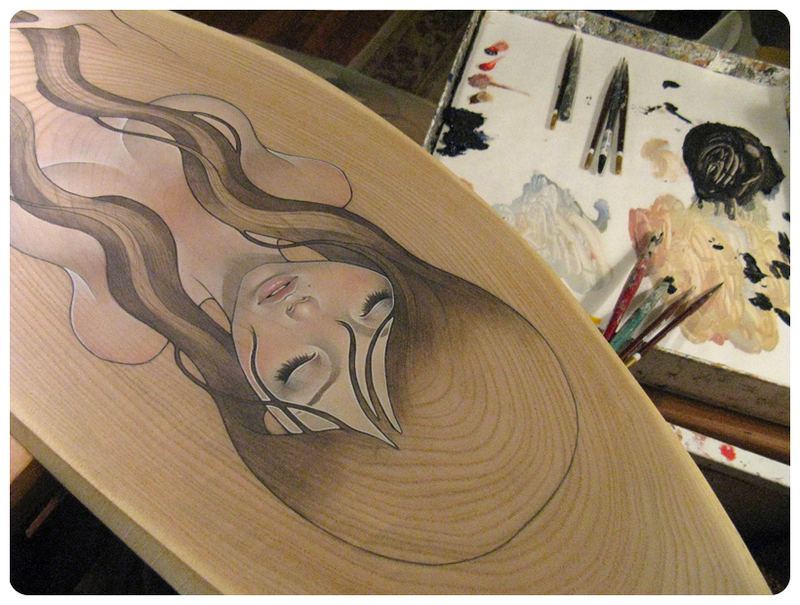 Audrey Kawasaki (AK): This coming show at Space Yui is my first show in Japan. Its titled “Watching Shadows ~Kageboushi~”.Â And yes, I did feel a bit of struggle, but that’s how it always is recently, which is expected. It would be boring if it was all a breeze. AM: We learn so much about Japan and it’s culture just by following your blogs, and we can definitely tell how much you love it. 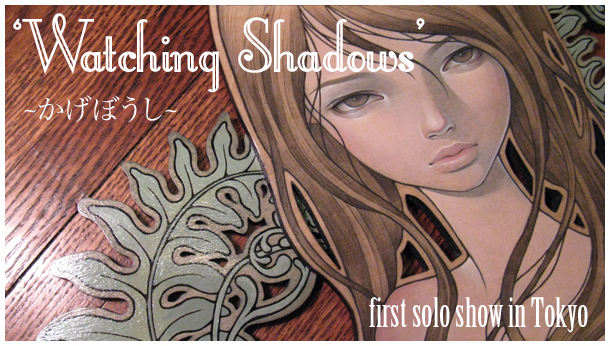 What does it mean for you to be having your first solo show in Japan? Are you feeling any different about this show compared to others? I’ve always wanted to show in Japan, but didn’t expect to, since I don’t have many connections there.Â Thankfully, I met Mr. Ito who is taking care of all relations and business aspects there.Â But yes, I do love Japan’s culture.Â When I visit, It’s like a dream world.Â Completely surreal.Â I’ve mentioned before in other interviews that ever since I was little I’ve been deeply connected to Japan and its culture and media.Â For myself and many others who live here, its a peculiar feeling to be connected to two distinct worlds.Â I don’t wish to live there though.Â I like it here.Â But, it’s always nice to have somewhere else to belong to.Â As for my work for this show, it didn’t feel too different preparing for it.Â There is one painting that was inspired by my recent visit there in March.Â And I would be interested in exploring that idea a bit. AM: If we are not mistaken, you are using some of the unique woods you purchased at Tokyu Hands for some paintings in this show. Did you try to use other materials from Japan for paint ideas related to Japan in this body of work? 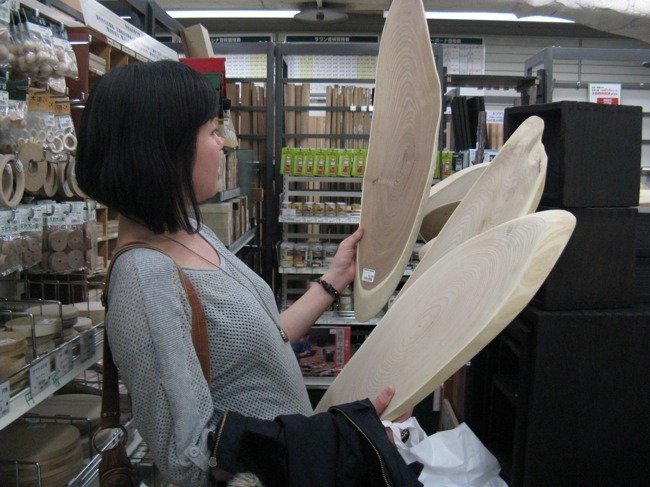 AK:Â Tokyu Hands is awesome!Â There is this one section with wood materials and exotic panels used for crafts, etc. and I wish to take it all home!Â When I visited in March, I intended to collect a lot more materials and inspirational books and sorts, but was limited in time.Â Hopefully, when I go for the show I will be more successful.Â I hope to take many more photos of the city and buildings.Â My usual works usually incorporate animals and floral, organic, natural images and patterns, so maybe it will be interesting to explore something more urban. AM: Rumors are that you’re thinking of taking a well-deserved hiatus from painting after your Australia show next year. Any truths to that rumor? 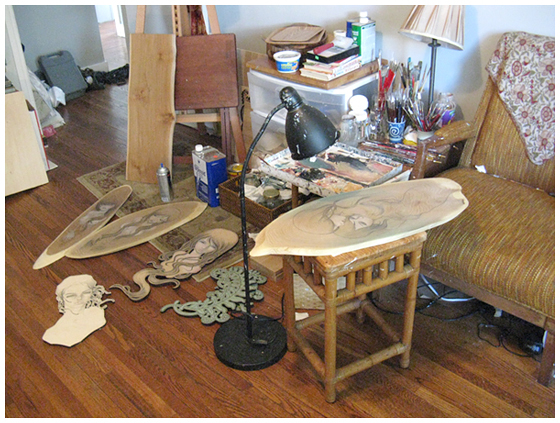 Are there any projects or other things you would like to do if you could take a break from gallery work? 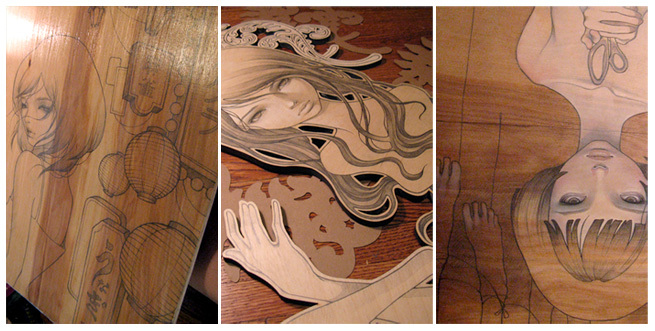 AK:Â Plans for next year are not for certain.Â I do plan for a show in Australia, and perhaps again in Japan, depending on how this one goes.Â It would be ideal to take a few months off at some point or at least have time where there isn’t a scheduled show and deadline coming up real soon.Â It’s been years since the last time I painted for myself, as in not for a show.Â It would be nice to paint a painting that will hang on my own walls since everything I make gets immediately sent off.Â So, perhaps in 2011, I can have more personal time to work on other commissions or small projects, maybe work on releasing a book then. Not sure. AM: Thanks for your time Audrey.Â Good luck and have fun in Japan. Categories: Art, Contemporary Art, Features, Interviews, Low Brow & Pop Surrealism, Previews, Shows & Events. 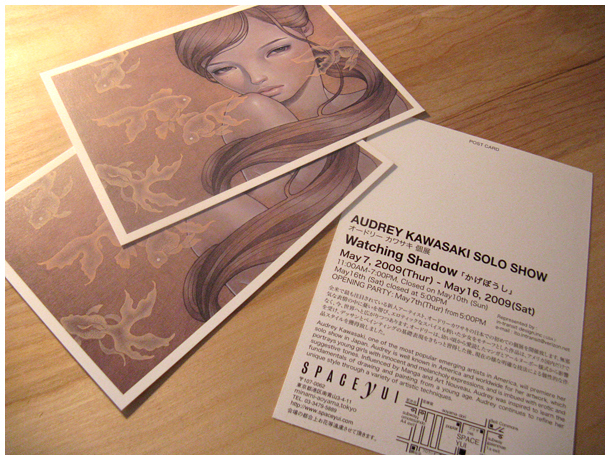 Tags: Audrey Kawasaki, Contemporary Art, Features, Interviews, Japan, Kawasaki - Japan - 09, Low Brow & Pop Surrealism, Shows & Events.